Every now and then a book comes along that is a ‘must have’ for traders. This is one of those books, clearly and cleverly written by advanced traders so that everyone will get something from it. This is THE book for CFD trading. You are probably already aware of the fact that trading Contracts for Difference enables you to leverage your trading dollars on both the local and global markets including Stocks, Indices, Forex and Commodities. CFDs Made Simple is an essential guide for anyone who wants to gain a complete understanding of what CFDs are, strategies used to trade CFDs and how you can use them in your portfolio. For those of you who have been around the markets for a while, you’ll have heard stories of people making lots of money and people also losing money. Given that CFDs are a leveraged instrument (you can lose more than your initial capital), like options or futures, it is essential you get all the facts before you commit your hard earned dollars. Hence the book ‘CFDs Made Simple – Simple, easy to understand strategies anyone can use for success’. Trading Contracts for Difference takes skill and patience and when you model the skill sets of professional traders then you greatly put the odds in your favour and CFDs Made Simple is your key to the door to building a solid foundation. You may be thinking a book titled CFDs Made Simple is for beginners but you can be assured that it not only contains the foundation for building a robust trading plan using CFDs, but will also step you through advanced trading strategies and money management techniques to really boost your trading potential. The reality is many websites will sell you the idea of how easy it is to not only replace your current income but multiply your profits exponentially year after year. Unfortunately these fantastic marketer’s are very rarely grounded in reality of what it actually takes to trade for a living. Both Ashley and Jeff have not only traded millions of dollars worth of CFDs, Indices & Forex over the last decade but have also traded full-time and experienced first-hand the incredible highs and lows of putting real money on the line gives you. So who exactly are Jeff and Ashley and how can they help you become a smart CFD trader? When CFDs first launched here in Australia, Ashley was one of the first 10 CFD traders in the country and traded CFDs full-time with a team of other traders out of an office in Bondi Junction, Sydney. Whilst Jeff was a late CFD bloomer he did in fact begin trading Contracts for Difference in late 2002 after successfully trading stocks and options. Not only is Jeff an accomplished trader in his own right but he is also the author of one of the most popular CFD books in the market called ‘Supercharge Your Trading with CFDs’. Ashley & Jeff have been trading stocks, options, CFDs, Forex and Indices since 1999/2000 and have literally taught tens of thousands of traders all around Australia how to become more strategic, smart and consistent traders. CFDs Made Simple combines Jeff & Ashley’s latest CFD trading strategies for success and covers everything you need to know about trading Contracts for Difference irrespective of whether you have never traded a CFD before, dabbled in CFDs or have been trading CFDs full-time for a couple of years. You could not find a more experienced pair of CFD traders and educators than Ashley and Jeff. I have known these guys for more than a decade on a professional level, and they have been at the forefront of the CFD market since it was first introduced in Australia. To have their collated wealth of experience put to paper, and succinctly outlined in this book, is an opportunity to tap directly into the minds of Australia’s leading CFD experts. Ashley and Jeff have a real passion and dedication to helping traders at all levels of expertise rise to the challenge and become more confident and consistent traders and put the fun back into your trading. Not only are you going to get a range of useful trading strategies but these strategies are going to be presented in a logical format, allowing you to implement them into your trading toolbox. Having had the opportunity of teaching thousands upon thousands of CFD traders over the years, Jeff and Ashley are well-positioned to discuss what the common CFD mistakes are but more importantly how you as a CFD trader can avoid them. traders encounter and more importantly, how to avoid them. enterprises and your CFD trading business is no different. going to need specific strategies to take you there. And that’s not all, this is only a brief glimpse of what Ashley and Jeff have been able to jam inside the pages of CFDs Made Simple. No doubt you can see that the lessons, strategies and techniques contained in this book are incredibly valuable for anyone looking to gain a full understanding when trading share CFDs, Index CFDs, Forex CFDs or Commodity CFDs. 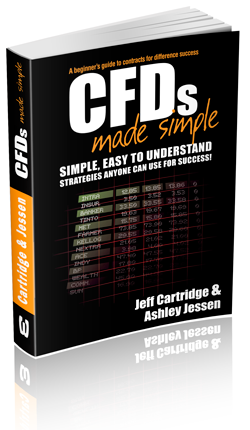 Jeff and Ashley’s number-one mandate when asked to create CFDs Made Simple, was to make sure the content was simple, easy to understand and had real-world CFD trading strategies anyone can begin testing straight away. You now have the opportunity to get your very own copy of CFDs Made Simple, allowing you to fully appreciate and understand the advantage CFDs offer you when used in a responsible and business like manner. YES Jeff & Ashley, count me in! Please send me your book as quickly as possible. I would like the opportunity to learn more about CFDs and establish an effective and robust trading plan that will provide me with the tools needed to move forward confidently. I understand that neither Jeff, Ashley or anyone else has made any income promises and my success is dependent on my own efforts and how well my CFD trading system performs under various market conditions. View our disclaimer here.